If you are going to disrupt an industry, it makes sense to challenge a service that doesn’t provide a good customer experience. Most people who I know have had a negative experience in a taxicab at one time or another. Hailing a cab, rude drivers, cabs that are late and never show up, dirty and poorly maintained vehicles are just some of the problems people encounter. The best innovations identify and solve a customer problem in a new and unique way. Brand Storyteller, Blogger and author Bernadette Jiwa says that “the job of every single business on the planet is to do just one thing – to make people happy. When you find ways to do that you win”. Uber is startup ride sharing service based in San Francisco. Uber was launched in 2010. 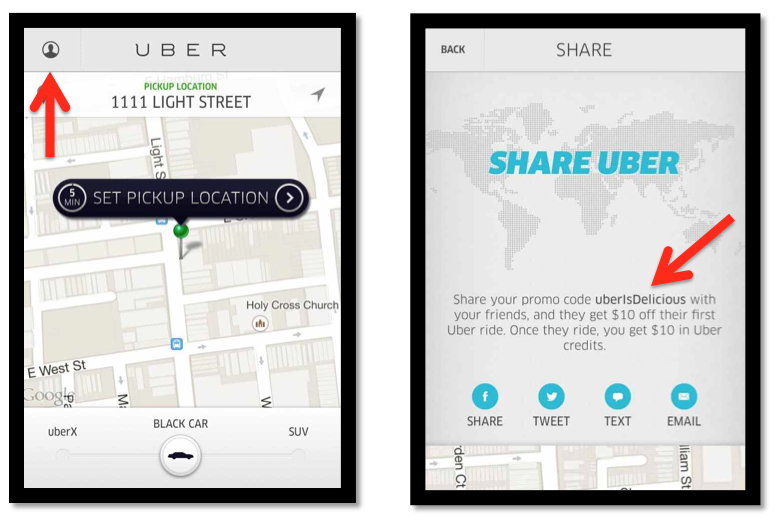 Uber utilizes mobile apps to connect passengers with drivers of vehicles for hire. Uber arranges pickups in over 200 cities worldwide. Consumers reserve a car by using a mobile app to request a car. The mobile app can be used to track the reserved car’s location, make, model, driver’s name, license plate number and estimated pick up time. I started using Uber as a result of a promo code that a friend shared with me this summer. A key lesson for content marketers is that good and useful content is easy to share. I downloaded the app on my iPhone, requested a ride and the driver arrived within 5 minutes. I had dinner that night with a friend in the Fells Point section of Baltimore. After dinner, I requested my ride from Uber and the driver again arrived in five minutes. The driver was polite and the during the 20 minute ride home we discussed basketball and the Baltimore Bullets. My experience was great. Following that experience, I have recommended Uber to several friends. I love Uber’s tagline “Everyone’s Private Driver”. In 2013, the USA Today named Uber its tech company of the year. For me, Uber, is more than a tech company. Uber is a brand that utilizes technology and data to create a great customer experience. Startup’s like Uber are very unique. They connect buyers and sellers through a unique business model. They use data to make sure users have a great experience. Data is also used to continually learn and improve the service. Consumers are able to rate their experience with drivers building trust in the Uber Brand. Uber is powered by technology but delivers a unique, human experience. Have you used Uber and if so how was your experience? I am always on the lookout for entrepreneurs who are creating new businesses and unique independent brands. If it involves food it is even better. Last week I attended a reception for Shoot Out For Soldiers, a 24 hour lacrosse game benefitting wounded soldiers. More on Shoot Out For Soldiers in another post. The Shoot Out For Soldiers event was catered by a company called MISSION BBQ. The food was donated. The barbecue dinner was outstanding. I instantly asked the question, What’s the story? MISSION BBQ was founded by Steve Newton and Bill Krauss, a couple of 50 something friends who shared a passion for great barbecue and a desire to build a business with meaning and purpose. The pair opened their first store on September 11, 2011 in Glen Burnie, Maryland, ten years after 9/11. Their idea was to serve good old-fashioned American barbecue while giving back to the community. A portion of their profits go to the Wounded Warrior Project, which helps veterans and their families. It was a way to thank soldiers for their service. MISSION BBQ and its employees are inspired by the following beliefs which are posted on their website. “We believe there is nothing more American than BBQ. And nobody more American than the brave men and women who have sworn to protect and serve our communities and our country. We do what we do for the love of our soldiers, firefighters, police officers, first responders – all our loved ones in service”. What a great focus. Mission BBQ knows who their customer is and who they want to serve. Each day at noon, they stop for a minute and play the national anthem through the loudspeakers at each location. They have create a unique brand and customer experience. MISSION BBQ is an inspiring story of two entrepreneurs who followed their passion and created a business with a purpose of giving back and thanking the hard-working people who serve our community. I wish them will. 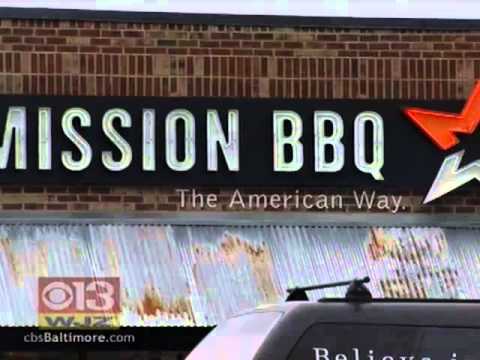 Have you eaten at MISSION BBQ? My parents took our family to Ogunquit, Maine for vacation when I was a child. Some of my best childhood memories occurred on the rocky coast of Maine. Fortunately, my wife and children share my love of Maine. We try to visit southern Maine every 12-24 months for a long weekend. It seems that every trip we discover a special place that we can’t wait to visit again. One of our favorite traditions on our trips to Ogunquit is starting our day at Amore Breakfast on Shore Road. It is easily the best breakfast I have ever had. The food is excellent and the service is outstanding. At Amore, “Love is the Maine ingredient”. Leanne Cusimano opened Amore in 1994. Leanne’s background was in teaching and furniture sales. When she founded Amore, her goal was to create a place of her own where people could enjoy good food and feel at home. Leanne believed that “food is love”, thus “Amore”. This year, Amore is celebrating its 20th year in business. The menu features a number of signature egg and omelette dishes.The home fries are the best I have ever had. Each item is uniquely prepared with a slight twist that makes it special. The coffee is also excellent. The black and white interior creates a warm and friendly environment that reminds you of the 50’s. In addition to great food, Amore has a warm and friendly atmosphere. This starts when you are greeted by Leanne and continues throughout your meal. Many of the waiters and waitresses have worked at Amore for several years. It is obvious that they love what they do. Amore Breakfast provides great service and the employees create a great and memorable customer experience. Amore creates an emotional connection with every customer who walks in the door. We eagerly await our next visit to Amore and are never disappointed. The Amore Breakfast story has spread through word of mouth and positive reviews on Trip Advisor, a feature on Rachel Rays “Tasty Travels” and part of a New York Times article on “36 Hours/Ogunquit Maine”. 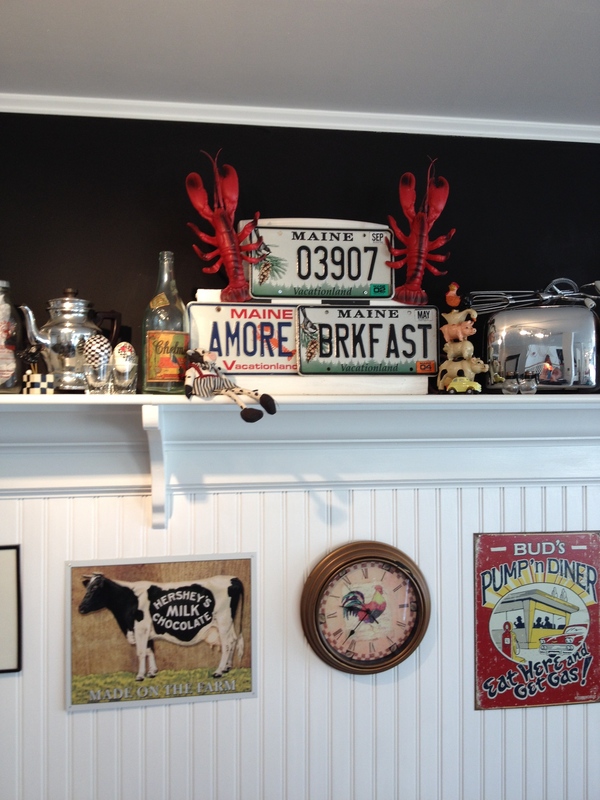 Have you eaten at Amore Breakfast in Ogunquit Beach Maine? Can Fitbit Sustain Its Rapid Growth? 90 million Americans are classified as obese. Many people can be described as professional couch potatoes. A study led by kinesiology researchers at the University of Tennessee, found that the average adult takes just 5,117 steps per day–barely half the daily steps recommended by the U.S. Surgeon General. Gym memberships increase right after the holidays but by mid-March attendance is down. Many people start fitness programs but lack the willpower to make it a regular habit. Can technology help? Wearable devices that monitor every footstep and exercise milestone allow people to keep track of their own fitness activities like never before. The devices track steps, distance, calories burned and sleep. Companies like Fitbit, Nike and Jawbone are enhancing users’ workouts through analytics, encouragement and the ability to share your accomplishment with friends through social media. These devices try to make fitness fun and interactive. It is the intersection of health and technology. The Consumer Electronics Association says the sports and fitness category is a $70 billion annual business in the United States. Fitbit has emerged as the leader in the fast growing digital Health and Fitness category. The NPD Research Group says that Fitbit has 77% of the market for full activity body trackers and 50% of the market for digital fitness devices. Most experts predict rapid growth in this category over the next three to five years. Fitbit was founded in 2007 by Eric Friedman and James Park. Friedman and Park realized that sensors and wireless technology had advanced to a point where they could bring amazing experiences to fitness and health. The company’s initial product, the Fitbit, was released in September 2009. It was the first wireless wearable fitness device for the mass consumer market. 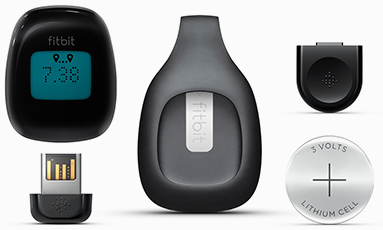 Fitbit’s offering has expanded to include several products including the Flex, Zip, One, Force and Aria. Their products are stylish and available in a variety of colors. Fitbit is sold at Best Buy, Dicks Sporting Goods, Sports Authority, Target and REI to name a few. Fitbit’s mission is to empower and inspire people to live a healthier more active lifestyle. Their goal is to design products and experiences that fit seamlessly into your life so that you can achieve your fitness goals whatever they maybe. Can Fitbit sustain its amazing growth? Wearables have become part of many people’s daily lives. Are these products a passing fad or a product category that will grow for years? Will smartphones through apps add this functionality and kill the category? Have you tried Fitbit or another wearable fitness product? Fast food is changing for the better. Every other Friday, I fly through Baltimore Airport, known to many as BWI, around 6PM after a long week of work. When I land, I am extremely hungry and ready for something good to eat. At most airports, I grab a granola bar and wait till I get home to eat because of the bad food. BWI has the typical fast food choices: McDonalds, Quiznos, Subway, a sports bar with an overpriced burger, Dunkin Donuts, a tasteless pizza place and, of course, a Starbucks. BWI has something that most airports don’t have: a Chipotle. Chipotle is the only restaurant in the airport with any customers. Last Friday, I patiently waited in a 15 minute line for my usual, a steak burrito. There was no line at McDonalds. Chipotle has changed the way consumers think about fast food. Chipotle has elevated the fast food experience through good food and natural ingredients at a fair price. As Joe from Chipotle tweeted “Its not easy to find good food in airports”. He’s right, but that shouldn’t be the case. Chipotle has successfully challenged many of the rules in the fast food industry. Consumers are willing to wait 15-20 minutes in line and risk missing their flight for the good food at a fair value that Chipotle is offering. Chipotle asked the question, “Why shouldn’t fast food and airport food be good and good for you?” They have changed the game and other fast food restaurants will need to change or risk major sales decreases. Have you eaten at Chipotle? People are dissatisfied with banking. A recent study from the Rassmussen Report reveals that American Consumers hold a grudge against banks who they hold responsible for the great recession. Many consumers believe that banks don’t have their best interests at heart. Bank fees are often confusing and hit your checking account when you can least afford them. People feel like idiots when they are hit with a bank fee. Most people, at one time or another, have had a nightmare customer service experience with a large bank. Large banks have some of the lowest customer experience and customer service ratings. People feel powerless to change things. Banks talk about being customer focused but very few of them empathize with the needs of their customers. Banks make money by keeping people confused. Like many people, Josh Reich got fed up with his bank after it charged him overdraft fees and he lived through a painful customer service experience. This motivated Reich, a software engineer from Australia, to come up with a better more human way to bank. Reich created Simple, an online banking company that was founded in Brooklyn and relocated to Portland, Oregon. 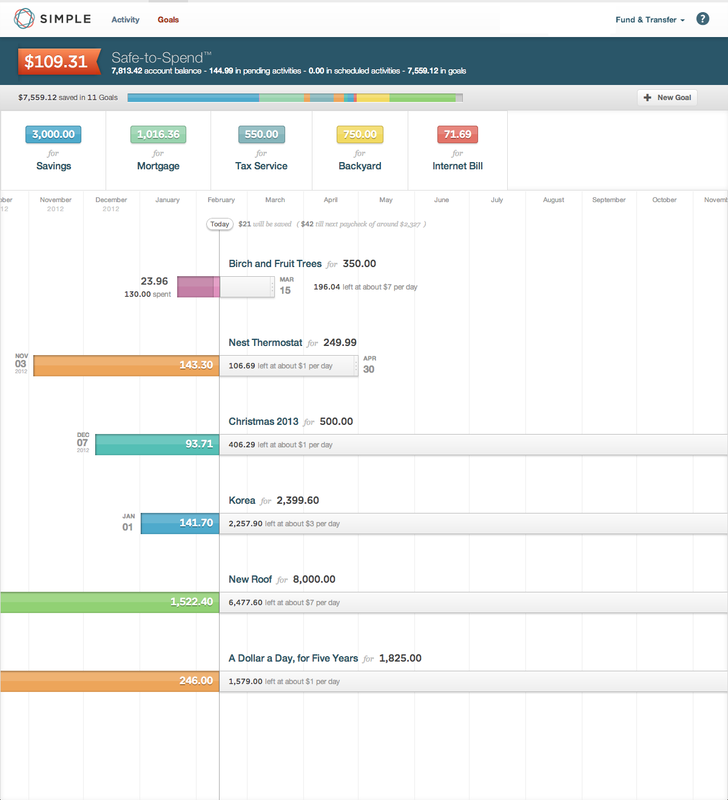 Simple offers customers free checking and data analysis of their transactions and spending habits. The company, which began signing up customers in 2012 now has more than 80,000 accounts and has processed transactions worth more than $200 million. Simple does not have retail branches. 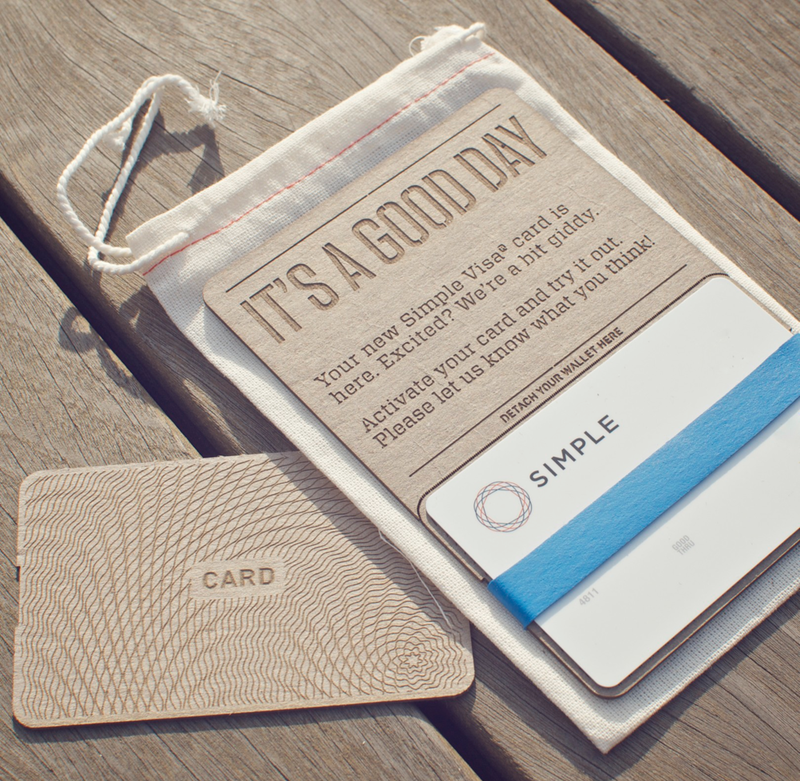 The Simple Bank Brand was developed to help people better control their finances. All employees in the company are unified in support of this common purpose. Their goal is to make banking more human by putting customer service at the core of everything they do. Simple is targeted to people who are dissatisfied with their current banking relationship. A Simple account empowers customers with powerful budgeting and savings tools built right into their account. These tools show customers how much money they have to spend and help people save for specific goals like vacations. Their website and mobile apps are clean, simple and easy to use. Simple gives people tools to help themselves, while still making sure knowledgeable, friendly people are there to help when you need them. The company’s biggest challenge is customer acquisition. Despite their current dissatisfaction, it is difficult to get customers to change and leave their current bank. Changing banks is a lot of work. Would you leave your current bank if a better more human option was available? For the past year and a half, I have enjoyed reading Bernadette Jiwa’s Brand Marketing Blog “The Story of Telling”. Bernadette’s blog focuses on the importance of storytelling in brand marketing. Her posts are short, simple and inspiring. Bernadette is a brand storyteller and strategist who challenges traditional approaches to marketing. 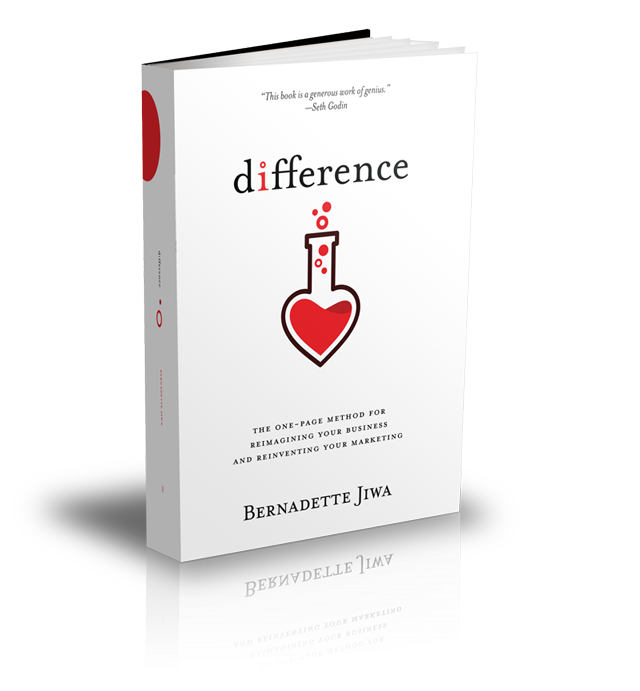 She recently published a new book titled “Difference”. I highly recommend “Difference”. It’s a must read book for innovative marketers. Difference challenges you to re-think your approach to marketing. Many people view marketing’s role as creating demand for existing products. Conventional wisdom advocates developing a product and then creating a big marketing funnel in order to sell it. Difference redefines how successful brands will be marketed in the future. In Bernadette’s view marketing is not a department, it’s the story of how we create difference for our customers. The businesses that succeed tell a better story because they have learned to recognize what’s true for their customers and then create solutions that matched their worldview. As Bernadette points out, “the truth is that people don’t fall in love with ideas at all. They fall in love with how those ideas, products, services and places makes them feel”. People don’t buy features they buy promises. One of my favorite parts of the book is when Bernadette shares her story of growing up in Dublin, the storytelling capital of the world. Bernadette describes how her little brother Johnny never greeted her by saying “hello” or “how are you?” The only question Johnny ever asked was, “what’s the story?” This is a common way to greet people in Ireland. It’s an open ended question that asks people to tell everything that’s important right now. Many great stories flowed from that simple greeting. Difference thinking is more than the ability to connect the dots, though. It’s about seeing the truth, recognizing the opportunity in that truth and then acting on it. It isn’t the person with the best idea who wins; it’s the person who has the greatest understanding of what really matters to people. The Difference Model outlined in the book flips product development on its head. Instead of starting with the idea, it begins with an examination of people’s current reality and explores what’s possible in a world where the problems and desires of those people are solved and met. A fundamental premise of the difference model is empathizing with your customer and asking questions to better understand your customer. Principles – What’s the truth about us, the industry, the market and the people we want to serve. Purpose – Why do we exist? People – Who are the people we want to serve? What do they value? What’s their current reality? Personal – How can we change how people feel? Perception – What do people believe about you? What would you like them to believe about you? Product – What do people really want? Difference cites examples of many brands who have taken this approach to solving customers needs. Examples include Apple, Uber, By the Way Bakery, Warby Parker, Airbnb and The Rubix Cube. Bernadette has created a Difference Map to help guide you through the process. You can download the map at Difference.is. It is a wonderful tool for planning innovation. Read Difference and experience a new way of thinking about marketing.